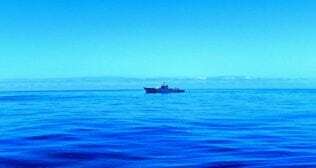 A new Scottish Government funded research programme into Blue Carbon began earlier this year as part of a commitment in the 2017-2018 Programme for Government. The current focus revolves around measuring the ability of various habitats to sequester carbon, understanding how it is stored for the long term, and building an evidence base on the effects that human activities may have on these process. To support the programme, the Scottish Government has sponsored a number of PhD students and Marine Scotland has just established the Scottish Blue Carbon Forum (SBCF), which will be made up of the students and supervisors of the studies, as well as external stakeholders and Scottish Government climate change colleagues. In this series of seven blogs, we will be introducing you to each of the seven students and letting them tell you more about their work. Blue carbon refers to the carbon sequestered and stored by coastal marine vegetation, including sea-grasses, mangroves, salt marshes and macroalgae, primarily kelp and other seaweeds. Large quantities of macroalgae are regularly shed from coastal sea beds, contributing a significant resource for nearby ecosystems. Seaweed detritus is consumed as food by many bottom-living organisms and thereby supports a wide variety of coastal food webs. Some of the detritus carbon is released as CO2 through grazing and decomposition, with the remainder deposited in sediments where it eventually becomes locked away in long-term carbon stores. The mechanisms by which carbon is sequestered into long term storage systems by seaweeds are poorly understood. My PhD aims to better understand the processes by which macroalgae contribute to the national carbon budget of Scotland. 1) To investigate the volume of beach cast and sublittoral detrital macroalgae using traditional (transect and quadrat) field survey methods combined with aerial photogrammetry and SCUBA diving surveys. 2) To investigate the processes of loss and decay of freshly deposited biomass using both in-situ and lab-based experiments. 4) using the data so gathered to create an informed estimate of the annual contribution of seaweed detritus across large-scale coastlines in Scotland and potentially the whole of the UK. 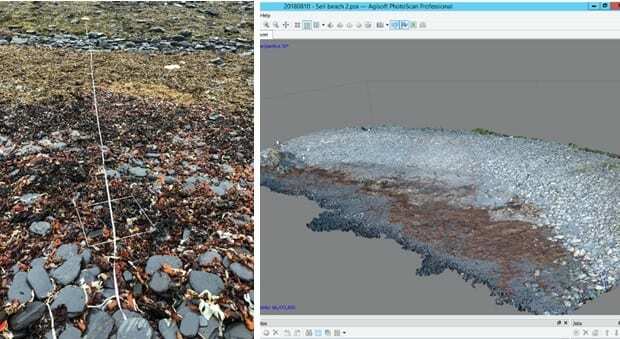 For the first part of this study, I have been conducting aerial surveys using Unmanned Aerial vehicles (UAVs), on beaches on the Isle of Seil which regularly accumulate beach cast material. This activity will be combined with transect and quadrat surveys designed to measure the composition, biomass and distribution of beach cast kelp in and around the Argyll area (see figure 1 below). Figure 1. Field study methods and aerial photogrammetry are building a dataset that will be used to determine accurate amounts of detrital beach-cast seaweed on a variety of beaches. The beaches have been chosen to have differences in topography, size, substrate type and orientation to help identify factors that are indicative of beach-cast seaweed. I also took part in a sampling cruise on board the Marine Scotland vessel Alba Na Mara, which focused on the inner areas of North-West Scottish loch systems. The aims of the cruise were to gather sediment samples for seaweed biomarker analysis and conduct video and photography transects of the benthic areas in lochs, areas where it can be expected that large amounts of detrital biomass might gather. The photography set up returned valuable data (Figure 2) and successful sediment grabs were collected in all the lochs we visited. This will be used to build estimates of biomass and distribution of detrital seaweed inside loch systems. The future plans for this PhD are dive surveys to look at the spread of detrital macroalgae on benthic areas to begin next year and will span across all four seasons to build a picture of seasonal changes in detrital composition and volume. There are also laboratory experiments to analyse the loss of key sugars that might act as biomarkers in sediment in their trial stage at the Scottish Association for Marine Science. Figure 2. Still frames taken from the sampling trip on-board the Marine Scotland vessel Alba Na Mara showing detrital kelp and evidence of burial in the inner benthos of loch systems. Left image is from loch Eriboll (Lat 58.53377333, Lon -4.63757), right image is from Loch Torridon (Lat 57.57610167, Lon -5.782161667).